There’s a big difference between fashion photography and standard apparel product photography. The two are related, but they’re more like distant cousins than siblings. Apparel product photography is focused on the product. The goal is to minimize distraction and present the product at its absolute best in a consistent and easily browsed manner. Fashion photography is focused on branding: models, location, props and other aspects of the shoot take on great significance. The goal is to create something unique that will arrest the eye and stick in the mind of the viewer, creating an identity that becomes attached to your product and, subsequently, your brand. To put it another way, fashion is the cover of a magazine or website. Product images are what’s inside. Want to see a real life example? Look at the home page of designer Marc Jacobs’ website. What is your eye immediately drawn to? The model’s face. Not the product. Multiple products are featured is this image, but the star of the shoot is the model and her pose. This image is about “the art of style,” as it claims. Products are not named or even linked to. The goal is to create a visual representation of the Marc Jacobs branded point of view. It isn’t to sell you an individual product. Fashion photography’s purpose is rarely to do so. 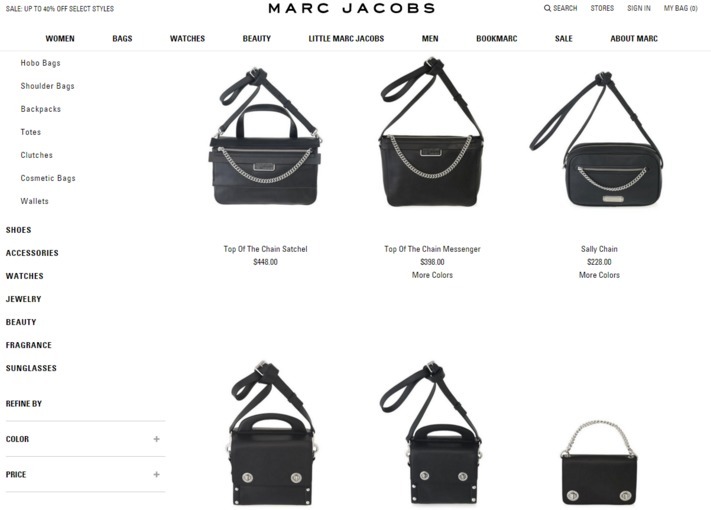 Now look at what you see when you browse a category page of Marc Jacobs’ website. What is your eye immediately drawn to? The handbags. The product. After all, there’s nothing else there. The product images are deliberately positioned in a consistent pose, facing the camera with straps knotted and turned to the same side. The images are consistently sized and aligned for easy comparison. There are no mannequins, models, props or even backgrounds. It’s just the product and essential data: name and price. This is product photography. Below, we outline everything you need to know to have a successful fashion shoot, complete with visual images consumers can begin to associate with your brand’s personality and point of view. This is about fashion photography for your brand, not simply product photos. First, you need an idea to build your shoot around. You can have the best equipment, most beautiful models and the most talented photographer, but without a central, unifying concept you won’t have satisfying images. You need to communicate your brand. Come up with something you’re excited about and great images will follow. Are you an outdoor apparel brand? A shoot on location in a remote corner of the globe may be what you need. Are you a modern, urban apparel brand? You may want to try something avant garde. Your concept should be something you can articulate in a single sentence or less, like Marc Jacobs’ “the art of style” or prAna’s “free to roam.” You don’t need to build textual messaging into your final image, but if you can’t say it then you probably won’t be able to convey it visually either. Your location should flow from your concept. Many fashion shoots take place in a simple studio with a plain black or white backdrop. That metaphorical and literal blank canvas allows you to build your concept through styling and posing. If you’re going to shoot on location, pick somewhere distinctive. An unfamiliar location is fun and visually stimulating, while familiar locations have positive connotations that make them effective messengers. Either can work, depending on your end goal. You don’t have to fly halfway around the world –– though if that’s in your budget, more power to you. Are you a modern, bohemian brand? Maybe there’s an old farmhouse outside of town that would fit your aesthetic. Are you a surf brand? Maybe there’s a coastal cliff that has great sunset viewing. Are you a lifestyle brand? Maybe there’s a local restaurant in a repurposed building with unique decor. Whatever location you choose, be sure to scout it before the shoot. Visit it on your own and visualize where you will put the model, how you’ll light it and pick your shots. This lets you plan without pressure and will help you stay focused during the shoot, saving you time and money while generating more shots. Your lighting setup will depend on your concept and location. If you’re going for a glamour shoot in studio, you will probably want a beauty dish with a grid attached to a strobe as your main light and one to three strobes for rim lighting. Here’s a helpful Lighting Equipment 101 that can help you identify your needs and shop for equipment. Position the main light on an axis with the camera so that it’s facing the model. Put the strobe lights behind the model facing into the camera. You may want the strobes to be visible for ambiance; if so, arrange them to be aesthetically pleasing. Casting a model is an important step. Don’t simply select the person you find the most attractive; select a model who matches your brand and concept. If you’re an active apparel company, you want an athletic model. If you’re selling swimwear, you probably want someone tan. Much like when shooting apparel product photos with a model, make sure the model you cast will look good in your clothes and the poses you have in mind. Pay attention to your model’s personality when casting and shooting. Don’t push them to be someone they’re not, especially if they’re inexperienced. If you want a shoot with lots of smiling and laughter, look for a bright and cheerful person. If you want a dark and moody atmosphere, look for a more withdrawn model. Models are expensive. If you’re looking to save money by using an inexperienced model, help them maintain a positive attitude. Encourage them throughout the shoot. Give them positive instructions and tell them what to do, rather than using negative “don’t” instructions. Keeping your model’s confidence high will lead to more natural shots. This one may seem pretty obvious, but think it through. Construct a complete outfit that you want representing your brand and that fits the concept. If you’re sending someone outdoors up a hillside, you probably don’t want them in high heels no matter how good it looks with the rest of your clothes. Prepare your product: repair any defects, clean it, steam it, whatever is necessary to have it at its best. Style it so that it fits the model perfectly. Details, details, details make all the difference between professional and amateur. If you can, hire a professional hair and makeup person. Bright lights wash out faces, so you need more makeup than in everyday life. Use blush, bronzer, eyeliner, mascara and fill in eyebrows. If shooting in studio, you will probably want settings appropriate to portraiture. A telephoto lens will flatten facial features to ensure they don’t appear disproportionate to the rest of the body, which should reflect positively on the subject. Set your camera to the lowest possible aperture to capture the most light. If you’re shooting movement in studio, like hair flipping, you will want a low ISO, moderate aperture, and relatively fast shutter speed. For example: ISO 100, f/16, and 1/250th. You can create new perspectives by changing the position of the camera or the model. Shooting from a low angle will make a model seem tall and long legged. Shooting from above can make a model seem smaller. Once you’ve captured your planned shots, have fun trying different things. Experiment with new and original angles. Shooting from somewhere with a dramatically different perspective, like up a ladder, may create an intriguing angle the viewer has never seen before. Create a high volume of shots and you may find an unexpected gem. After you’ve finished your shoot, it’s time to apply the final polish in post-production processing. Use Photoshop to cut out background features that you don’t want, using content aware fill. Give shadows color for glamor, if desired, but be careful not to wash out skin. Zoom in on skin and take out imperfections with lasso and content aware fill, or spot healing brush. Brighten eyes using the burn tool, fill in eyebrows and add definition on eyelids. In Lightroom, you can use luminous on skin to smooth it out, but be careful not to go too high (like more than 30%) or skin will begin to look fake and doll-like. Follow these do’s and don’ts of skin retouching. Don’t go crazy in Photoshop or it will be noticed. You want your images to look natural. The Redbook example above featured Faith Hill on the cover in July of 2007 — practically the Stone Age in internet years — but is still talked about today as an example of retouching gone too far. After you’ve finished your fashion shoot, it’s time to take care of the rest of your website. You have the cover, the editorials and all the branding out of the way. Customers will know who you are and hear your message. Now, you need product images to give customers something to actually shop. But that’s a story for a different day. For now, revel in having realized your concept. It takes a lot of time and talent to bring an idea to life. If any picture is worth a thousand words, then surely a well-executed fashion photo is worth a thousand pictures –– and many more sales.